IRVINE, Calif. – Female motorcycle ownership is at an all-time high according to the latest data from the Motorcycle Industry Council. 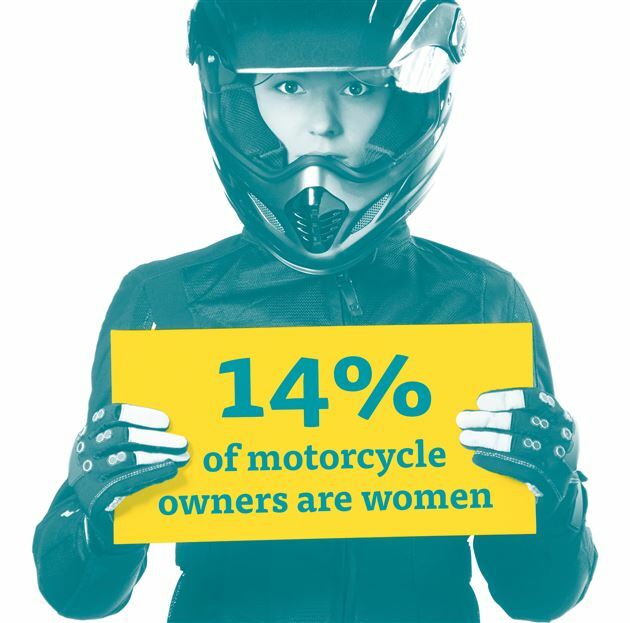 The MIC’s latest Motorcycle Owner Survey found that women account for 14 percent of all U.S. motorcycle owners, well up from the 8 percent reported in 1998. Among younger generations of owners, the percentage of women is even higher. Slightly more than 17 percent of Gen X owners, and 17.6 percent of Gen Y owners, are women. Among Boomer owners, women make up 9 percent. The Owner Survey also revealed what type of bikes women prefer. Cruisers are the choice of 34 percent of female riders. Scooters rank a close second at 33 percent, followed by sport bikes at 10 percent. In the survey, of some 48,000 American households, women were also asked to share their top three reasons for riding motorcycles. They answered “fun and recreation,” followed by “sense of freedom” and “enjoy outdoors/nature.” When it comes to purchasing a motorcycle, women rate “Fuel Economy” and “Test Rides” as the most important decision-making factors. The study revealed that female riders are safety-conscious. While 60 percent of women took a motorcycle safety course, only 42 percent of men had any formal training. In some state motorcycle safety training programs, women make up 30 percent of the student population.